It is expected that Monty will settle down and join his father in business, a plan in which Monty has no interest. In order to push off the inevitable, he plans a Grand Tour of Europe with his best friend (and secret crush) Percy. Monty's plans for a year long party throughout Europe are dashed when his father insists on sending along a chaperone as well as Monty's stuffy sister Felicity who is to be dropped off at finishing school. After a dreary month touring museums and listening to recitals, the two boys and Felicity manage to attend a party where Monty quickly runs afoul of an important man and subsequently steals something from his room. The stolen item is more than a souvenir, however, and the man will stop at nothing to get it back for it could hold the secret to eternal life. Now the adventure, and danger, really starts. 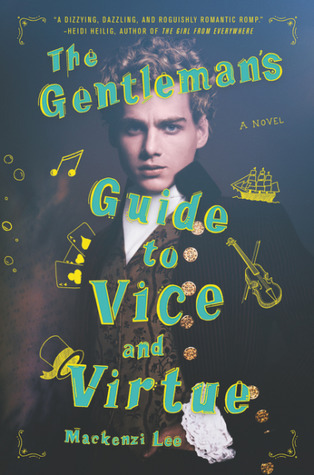 I expected to love a book with a charming bisexual character on a Grand Tour. I didn't dislike it, but I wasn't as blown away as I expected. Expectations.... Monty is, indeed, charming but for much of the book that was all he was. Well, charming AND irresponsible. Whenever the three would finally get something rolling, Monty's actions would somehow mess it all up again. It got a bit frustrating. I also found myself frustrated by the typical romance arc of misunderstandings that got in the way of Percy and Monty finding true love. He likes you already! Kiss him! One section in particular sticks in my brain regarding that: When Percy suggests they shirk their responsibilities and run away together and then is greatly offended when Monty mentions their lack of money. At that time, that would be a HUGE consideration. And two gentlemen would have a difficult time taking care of themselves or finding suitable work. Less romantic, to be sure, but accurate. However, it's not all gloom and doom. I liked the book although I found it a little slow and I'm not sure even now that I completely get the deal with the heart. But my favorite part of the whole thing has to be Felicity and her growth from drudge to amazing person. Growth isn't really correct, she was amazing the whole time but not through Monty's eyes. I love when she stitched up her own wound and all the things she knew how to do thanks to her studying. I hope she decides to act on the offer she is given towards the end of the book because I can totally imagine her being free and sailing the seas.